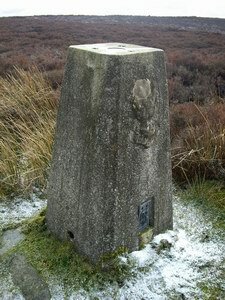 Is ranked joint 2236th with 25 other trigs (more). A young man at the outward bound centre kindly allow us to park in the car park. We then walked the Upper Ceiriog Way up a steep lane southwest to the 472 spot height. The track west shown on the O.S map, which is no as clear on the ground but dose go all the way out to the boundary stones. The last 100m or so is through heather which has been cut in places. A very pleasant walk. Pillar has a chunk out of one corner exposing spider otherwise in good condition. 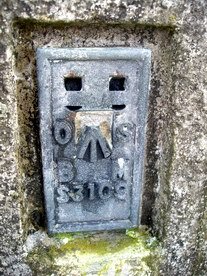 OS plug with faded lettering. Engineers crest. Open moorland but cloudy day meant only surrounding hills in view. Parked at end of road then set off along track before heading across fields in direction of pillar. 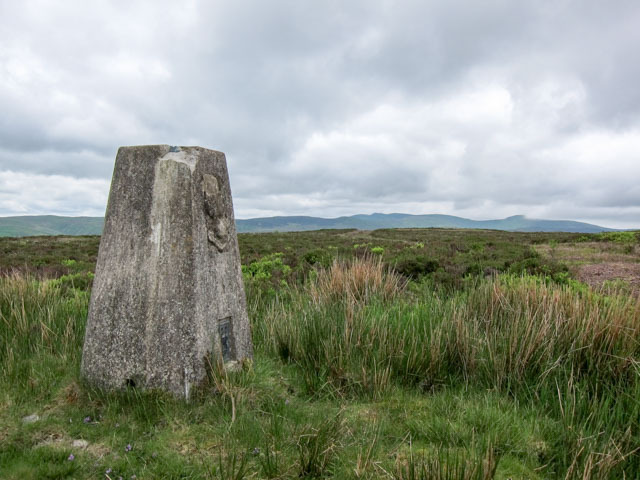 Approached via Mynydd Bach. Heathery for last few hundred metres but some cropped lines to follow. Bryn Du Chunk missing from top corner. 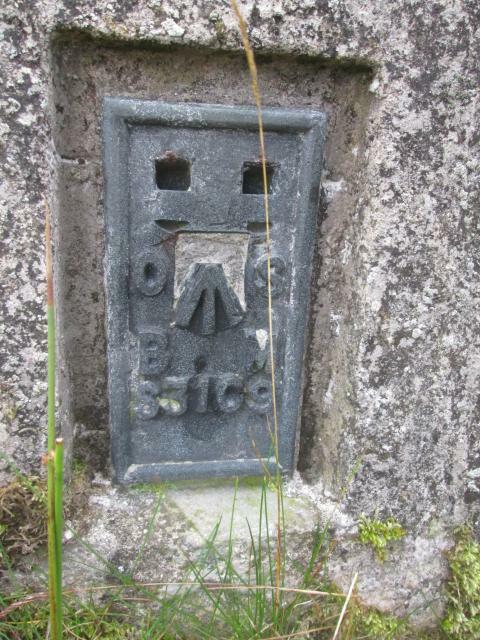 Has embossed feature on N side of trig above FB. Bryn Du The FB, faces N. Three sight holes open but not the FB side. 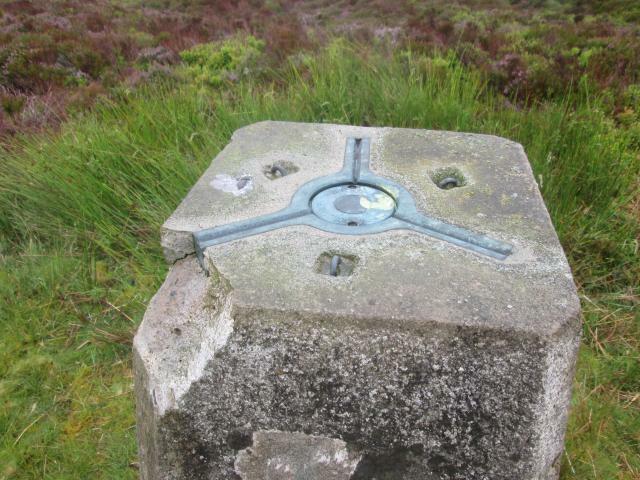 Bryn Du Top of trig, OS cap with shallow indented letters. 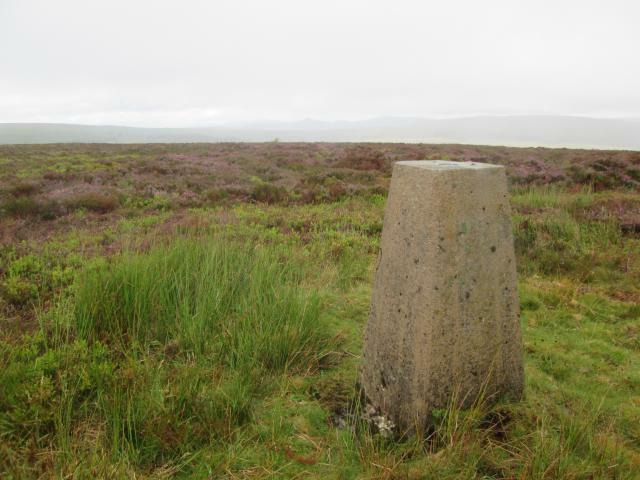 Bagged as part of a 13 mile 3 trig walk. 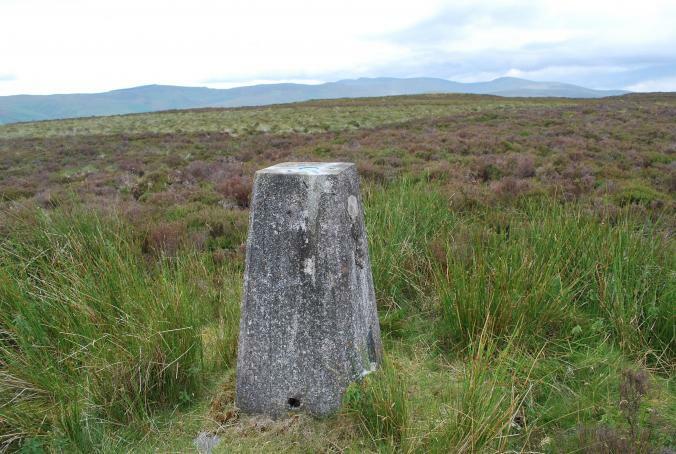 Approached from Moel Fferna which meant a lot of heather bashing to reach the summit. Good view. Walked from the south. Parking near Coed Bach on track near small area of forestry. High point visited close by. 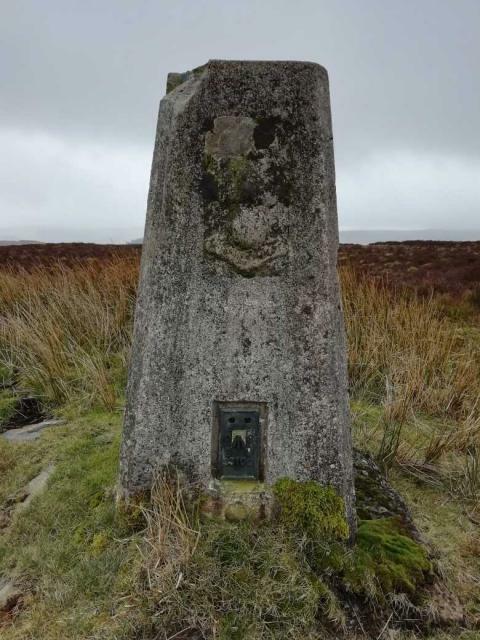 Visited on circular walk from Pentre - Moel Fferna - Bryn Du - Pentre. Heather bashing and hot! Chunk out of NE corner. Lovely views to the main Berwyn ridge on descent to Pentre. Well windy up here today, but great all round views. 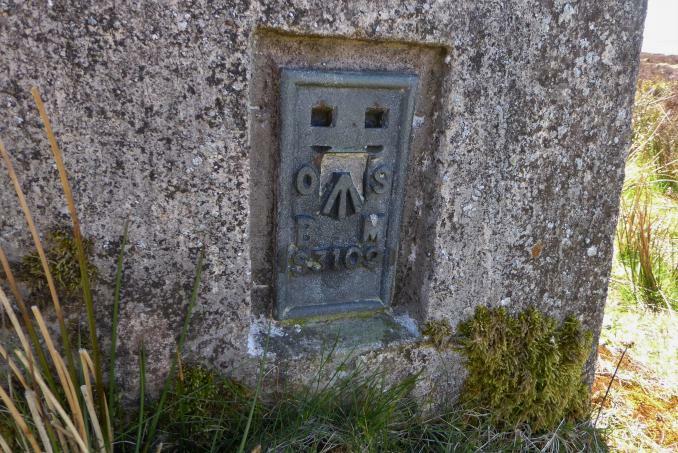 Slight damage to NE corner, centre cap with indented lettering, some sort of crest cast on the face of the trig? This heathery hill was a bit of a sting in the tail after a long, hot day. Was very glad that I noticed the Dewey summit being 200 metres westwards before it was too late. A quick walk up from Llanarmon (which still as two pubs and not that many more houses !! )Last 100 yards or so across heather. 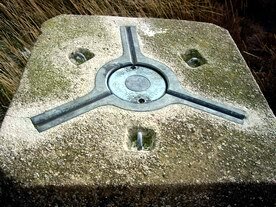 Not the best hill/ trig . 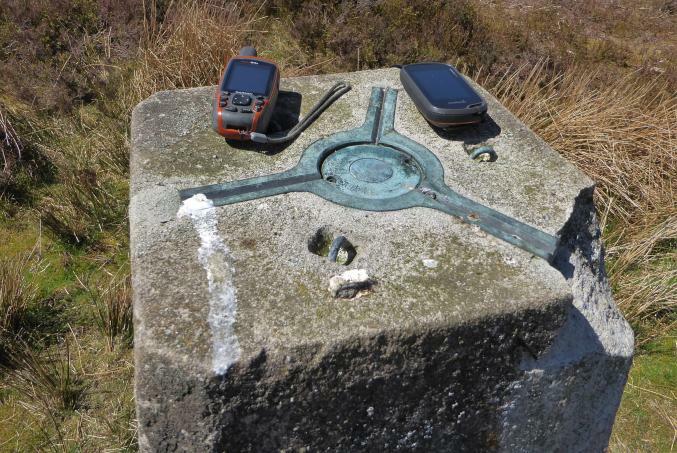 A rarely-visited trig, partly due to the fact that it's in the middle of nowhere much, and partly the fact that it involves wading through a fair bit of deep heather. The 'Private' signs are almost certainly related to the use of the moor for grouse breeding, although it's not very actively managed at present (mostly deep and old heather, rather than the burnt and cut variety). Father Ted's noisy birds with long curved beaks will presumably have been Curlews. a proper Berwyn experience. not a soul about.. headed off further into the wilderness after this un. 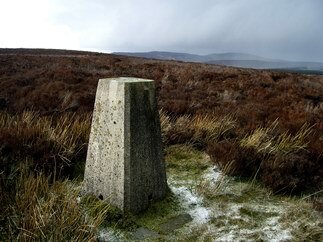 Lovely location,parking at Ty-Du to the N. Byway then across open hillside to pillar. Not sure how the "Private keep out" sign attached to the gate is compatable with the open access sign right next to it though ! Best to just ignore, along with all the other private notices on the gates,weather was kind and afforded us some good views. Last pillar on Explorer 155. Not very often visited this one and I can understand why. It's a bit of a treck and the last 150 meters through deep heather. I had great weather for my visit. 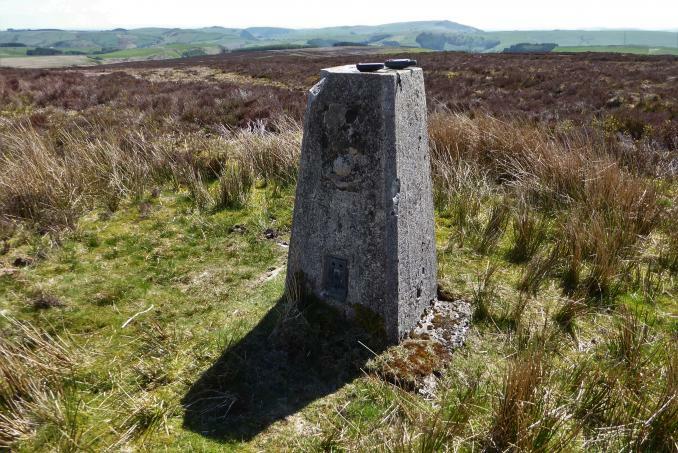 The FP on the map to SE is not waymarked on ground I guess cos it is open access land but I think the grouse breeders want to keep it to themselves. No grouse to be seen but some noisy birds with long curved beaks. My ornatholgy is dissapearing fast! 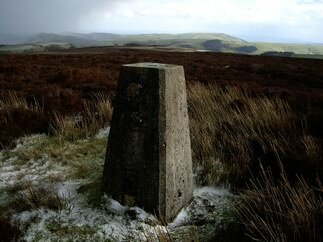 A lovely spot this above Llangollen; you can see for miles in all directions. You have to pop through a gate marked 'private' for the last 100 yards to the pillar but there wasn't anybody around for miles so I wasn't too worried. I would appreciate those in the know checking the number on the flush bracket as it was so badly corroded it was almost impossible to read and I may have got it wrong! 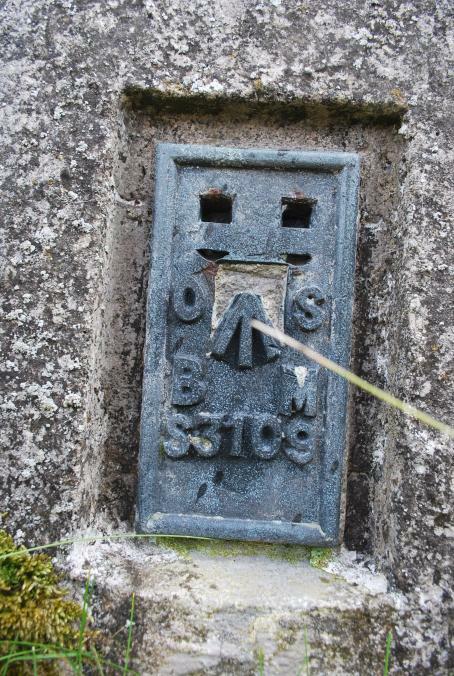 Otherwise the pillar is in good shape with the original plug. Above the flush bracket there is a rectangular recess where there was apparantly a plate of some kind which has now gone. No idea what it could have been. Right up here amongst the heather I doubt if many people would have read it anyway!! Great spot! No details noted - OK view @ sunset Mar05, referring to Lathama's log - yes S3109 seems to be the consensus. Quite a few pillars in this area have the Crest: someone made a case for it being Royal Engineers, IIRC. Raw Head has a pristine one. Regimental crest (grenadiers?) 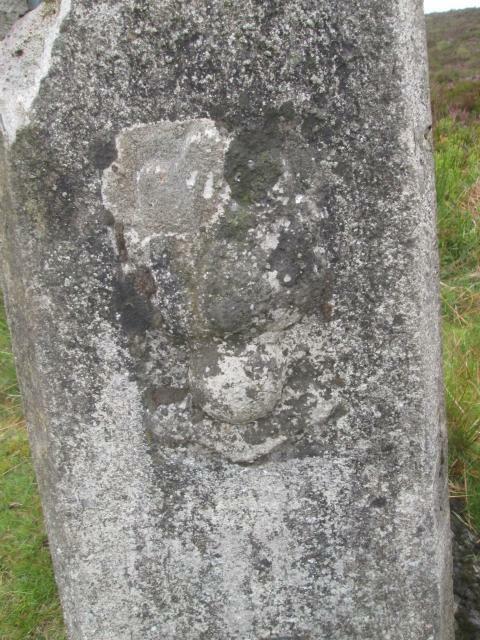 cast onto side of pillar. Plug with indented lettering.